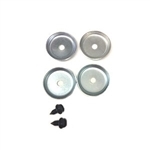 Kit includes (4) 2.25 Dia inner fender cup washers and 4 piece hardware. Correct Bumper and screw assembly to adjust front of hood height. Includes 2 bumpers and 2 screws. You don't have to try and clean up or look for those missing fender extension hardware nuts and bolts. We offer a great hardware kit that will install both fender and extension on your 1967-68 Camaro or Firebird. This kit contains 8 technically correct j-nuts and 8 screws that will do both extensions. Works on standard and Rally Sport models. Correct chrome hardware to mount vent window frame to door. Includes 6 pieces. One kit per door. Reproduction quarter window track hardware kit. Includes body mounting studs, plated steel and correct over sized flange nuts. One kit does one track. Correct reproduction fender bolts for all 1967-69 Camaro and Firebird models. Correct black oxide bolts and nuts. Includes all the fasteners, washers, shims and nuts. Reproduction of the original floor pan plastic plugs for use with floor pans and trunk pans on all 1967-68 Camaro and Firebird models. This is a 12 piece kit. Replacement headlight adjustment kit for all 1967-68 Friebird models. This 20-piece set includes adjusters and springs for both right and left sides. Correct #8-1/2" black oxide screws to install the roof rail molding track on all 1967-69 Camaro and Firebird coupes. This kit includes 24 piece to do both rails. Reproduction of the original floor pan plastic plugs for use with floor pans and trunk pans on all 1969 Camaro and Firebird models.This is a 12 piece kit. Correct reproduction inner fender to fender bolts for all 1967-69 Camaro and Firebird models. Correct black oxide bolts and j-nuts. Includes all the fasteners, shims, j-nuts and fender cup washers. Replacement headlight adjustment kit for all 1969 Firebird models. This 12-piece set includes adjusters and springs for both right and left sides. Correct reproduction upper and lower door hinge bolt set. This kit does both lower and both upper door hinges. This is a 30 piece kit. The most correct comprehensive front sheet metal bolt kit available. Correct black oxide bolts and j-nuts. Includes all the fasteners, shims, cage nuts and fender cup washers required to mount all the front sheet metal on your car. This kit works on all 1967-68 Camaro models except Rally Sport model. The most correct comprehensive front sheet metal bolt kit available. Correct black oxide bolts and j-nuts. Includes all the fasteners, shims, cage nuts and fender cup washers required to mount all the front sheet metal on your car. This kit works on all 1967-68 Camaro Rally Sport model only. The most correct comprehensive front sheet metal bolt kit available. Correct black oxide bolts and j-nuts. Includes all the fasteners, shims, cage nuts and fender cup washers required to mount all the front sheet metal on your car. This kit works on all 1969 Camaro models except Rally Sport. The most correct comprehensive front sheet metal bolt kit available. Correct black oxide bolts and j-nuts. Includes all the fasteners, shims, cage nuts and fender cup washers required to mount all the front sheet metal on your car. This kit works on 1969 Camaro Rally Sport model.